The researchers have checked 28 of the variants of interest, unfortunately none have proven to be the suspect gene. They are currently preparing lab work to check another set of 27 variants, and have a simultaneous SNP chip process running to identify other potential genes. They will keep us updated on a regular basis and are preparing a study flyer for us to distribute and post on the website. As many of the members are aware, a dwarf (Chondrodysplastic) puppy has been produced in an open breeding between dogs with very low probabilities. The pedigrees of these dogs do not have any obvious ancestor with a high probability or unknown background. This has made it necessary to revoke temporarily the certificates issued to many of the dogs in these pedigrees. We are in the process of arranging some test breedings to help determine where the gene is coming from so we can reinstate the certifications for dogs not involved. There are very few carriers/dwarfs available for test breeding, so dogs that are closest to the affected dog will be test bred first. It is important to remember that our certification program is based on probabilities. A probability below 6.25 means that it is unlikely that the dog carries the gene. This does not mean that we are certain this dog does not carry the gene. Even dogs that have been test bred, still have a probability for carrying the gene, albeit a very low probability. The littermates of the dogs who are in this pedigree are as affected as the dogs themselves, that is why the littermates have also had their certificates revoked. Dogs in this pedigree that have been test bred and cleared by this retain their probability from their test breeding results. How did we arrive at the new probabilities? Starting with the parents of the puppy, they are carriers so their probability is now 100%. Each generation behind them the probability is cut in half, so their parents are 50%, grandparents 25%, great-grandparents 12.5 % and by the 4thgeneration this becomes 6.25% which is the level chosen for issuing certificates when this program was begun in the 1970’s. 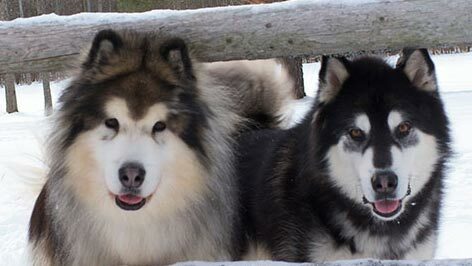 There is a series of excellent articles on this whole program written by Linda Dowdy on the Minnesota Alaskan Malamute Club website. Please read these if you have any questions about the details of this process. The website is http://alaskanmalamute.org/health/chondrodysplasia-a-closer-look. Dan Anderson has done his best to provide a complete list of the dogs affected by this situation. It is possible that he has missed some dogs, so please bear with us as we may have to add dogs later. AMCA will be contacting all of these dog’s owners to inform them of the change of status of their dogs with regard to Chondrodysplasia. With the assistance of the Canine Health Foundation, the CCC and the Health Committee have been working with a research group in Helsinki,Finland for the past year to find the gene for Chondrodysplasia. This group identified the gene for Norwegian Elkhound dwarfism, so we have high hopes that they will find our gene as well. DNAf rom all of the dogs directly involved in this pedigree is being sent to Helsinkito facilitate their work. Please see the Health Committee Column as well as the AMCA website for updates on this project. In the meantime, what is a breeder to do? I would recommend that the breeders do the breedings they have planned. If they are breeding dogs with a close relationship to the dogs in the affected pedigree, they can x-ray their puppies to make sure they have not produced a dwarf. These x-rays are simple, inexpensive and should be done when the pups are between 5-12 weeks. The x-rays can be sent to Dr Sande who will then issue a letter with his official opinion which the breeder can use if need be to show that the pups are not affected. This is not a test breeding, but would help to identify affected puppies if any are produced. All of the information you need to x-ray puppies and even reading the x-rays is available on the Minnesota Malamute website. Our Code of Ethics does not preclude breeding dogs with high probabilities, it says that you must be honest with the puppy buyers and the owner of the dog you are breeding to. Chondrodysplasia is only one of the many problems affecting our breed. We all have to make the best decisions we can with the knowledge we have. We hope to have results of some of the test breedings planned within the next 8-12 months. This may result in dogs’ certifications getting reinstated. If the Helsinki group gets lucky and find the gene quickly, then everyone can test their dogs and breed carriers to non-carriers and not narrow down our gene pool even more than it is. Please thank the owners of these dogs for allowing us to publish their pedigrees and for all of their cooperation in a very difficult situation. We need to have everyone’s support if we are going to eradicate Chondrodysplasia. These are the pedigrees of the sire and dam of the litter which included a puppy whose x-rays were examined by Dr. Sandee and deemed to be affected by Chondrodysplasia. The dam is Mimmenuk’s Dancin’In The Dark, known as Layla. The name of the dwarf pup is Mimmenuk’s U Rock My World, known as Jackson, born May 4, 2012.